There is a good reason for the existence of Porsche stone guards. Porsche’s 911 heritage has normally been known for the cars’ wide hips. These wide fenders love getting pelted with rocks. The Porsche 911 and wide hips go hand in hand. The tradition of wide fenders carried on for decades until in 1998 the 996 arrived with barely anything in terms of wide fenders. The 996 was only mid-cycle when the 996 Carrera 4S came out, hinting back at slightly wider fenders. This proved to foreshadow the 997 to come. 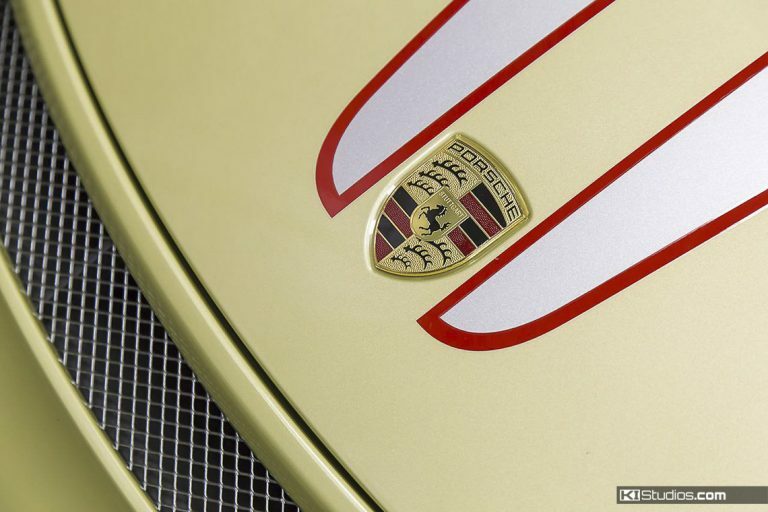 Porsche history aside, there is one key factor common to almost all 911s. This is the fact that the wide rear fenders create an ideal surface to ricochet pebbles that come flying off the front tires. 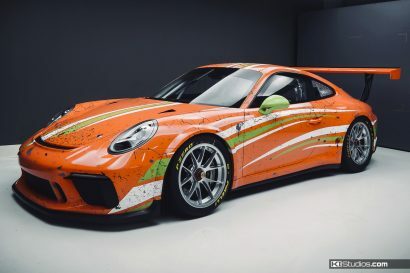 As you can imagine, this is where the famous Porsche patina of pelted fenders came from. This is even more noticeable on Porsche racing cars as they take lots and lots of pebbles at very high speed. 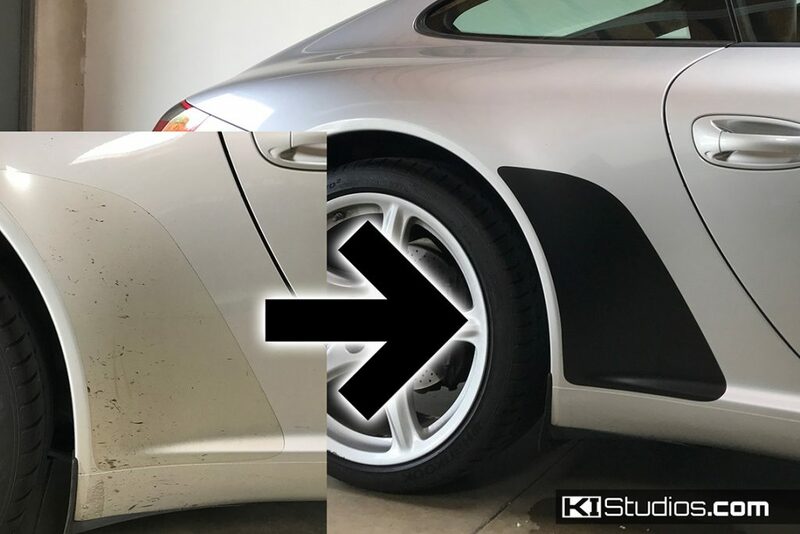 Porsche’s solution to the problem has traditionally been to offer clear paint protection vinyl, or Porsche stone guards. These sections of paint protection vinyl film are also known as shark fins, due to their shape. They help protect the frontal area of the rear fenders. These factory stone guards generally offer poor self-healing characteristics, if any. They tend to ding and mar pretty early on. Finally, yellowing occurs pretty quickly. This happens much, much sooner than it does to high-quality paint protection film from the likes of Xpel, Suntek and 3M. The solution comes naturally in the form of aftermarket. At KI Studios we offer such solution. As is often the case with many aftermarket components, the quality is better than factory. We offer Porsche stone guards for the Porsche 997, the 987 and the 991. We use the highest quality, self healing, paint protection film on the market. This stuff protects the paint on your fenders as it gets pelted by gravel. The material self-heals so it stays looking like new for a long time. 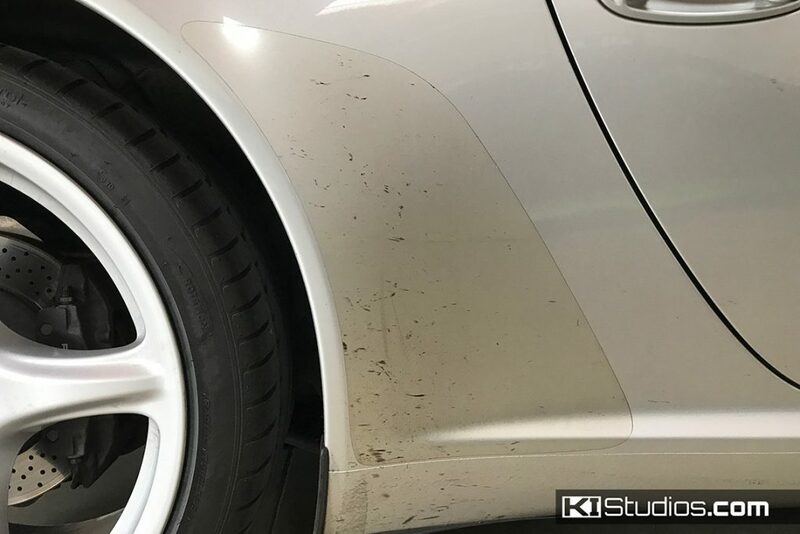 We offer the top-of-the-line self-healing clear paint protection film as well thick matte black vinyl designed to be more durable than standard wrap air-release vinyl. If your factory Porsche stone guards are looking at little weathered and yellow, you can easily peel them off with a clothes steamer. Then you remove the glue residue with a little Goo Gone and a bit of Isopropyl alcohol. 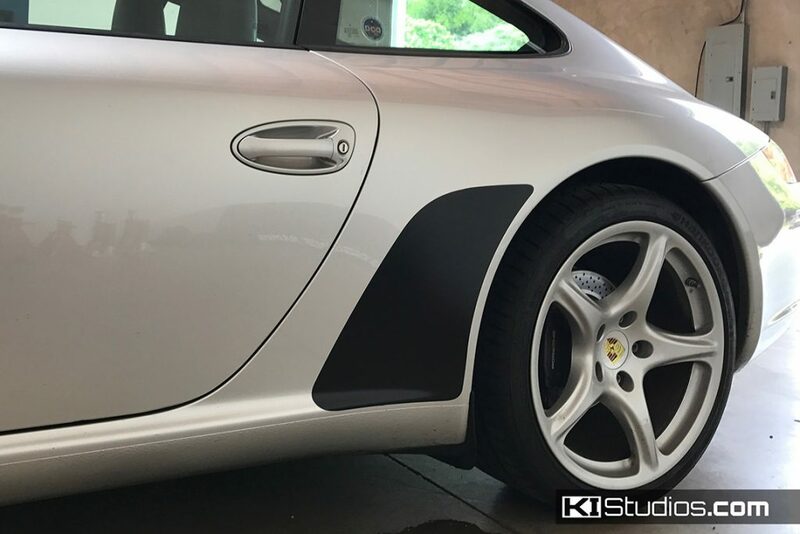 Now the surface is ready for the KI Studios Stone Guards for Porsche. These you can install with a solution of soap and water, with a squeegee and the aid of a heat gun. It’s generally pretty easy enough for DIY on a weekend. Stop staring at the old worn out Porsche stone guards. Order KI Studios Stone Guards for your Porsche 997, Porsche 987 and Porsche 991 today.